I could not sleep last night — and, I could not pray. Instead, all I could do was weep and sigh as I tossed and turned throughout the night. This morning, I am physically and emotionally tired. Last night it felt as though everything I have seen and heard this week as we have reached out to Syrian refugees decided to visit me like the ghosts that troubled Ebenezer Scrooge. They came in turns and sat on the edge of my bed and begged me not to forget them when I return home. They came, one after the other, pleading their case and their cause. In the still of the night, I felt the presence and the pain of those we have helped this week. And, all I could do was to weep for them. I had no words. It started when I took the elevator to my third-floor room at the end of the day yesterday. I thought of the refugee family we had visited hours before, paying rent to sleep under the stairwell of a building. And, as I slept in the comfort of my hotel room, the fresh memory of our visit with a family of eleven crammed in to a hundred-square foot workroom in the basement of an apartment building kept me awake. The warmth of my room reminded me that they had no heat. I know that we have limited resources to help and cannot do everything. I am, however, thankful that we have given a measure of relief and hope to every person that God has put in our way. I wish we could do more, but I have to trust that others will come after us to serve as the hands and feet of Jesus. I am determined to remember those who are suffering in Syria and the displaced who find themselves in crowded camps and cramped and cold little rooms in places like Jordan and Turkey. I will not forget their tears and I will not forget my own. This morning I remembered something that I had read last week as I was studying Psalm 6. David said, “the Lord has heard my weeping” (Ps. 6:8). Think about that for a moment. God “hears” weeping. In a sense, tears are words. Charles Spurgeon said, “Weeping is the eloquence of sorrow. Let us learn to think of tears as liquid prayers.” I like that. 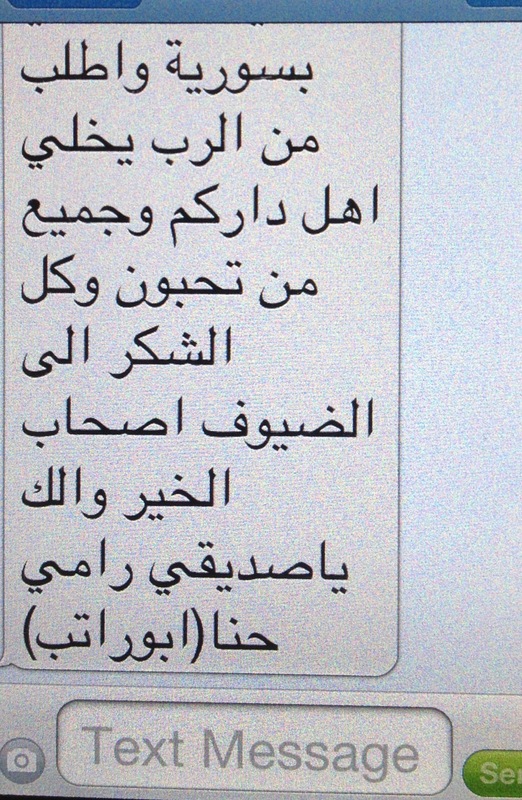 Yesterday, my friend Jamal Hashweh, Director of Global Hope Network received a text message from a Syrian refugee family we visited two days ago. The eldest son wrote: “Thank God. Thank God. Thank you God for the words we heard yesterday and for the prayer that drove my daughter to tears, and also my Dad. We all felt as though we were back home in Syria.” I am grateful that God hears our weeping and that He understands what we cannot put into words. The daughter who wept in her father’s arms as I prayed for her family is precious to God. He heard my prayer for her family but he also heard and understood her tender tears. I pray that one day soon He will answer our prayers and that this family and the others we have met will be able to return to their homes and live in peace. Thank you for following our journey. In a few hours we will continue our work among the refugee families in Jordan. Please pray that God will continue to strengthen our hands for this good work. To say that this journey has been amazing seems to almost minimize it, in terms of what I have read in your blogs this week. Even though you are a wonderful writer, given these stories, I feel as if I can only barely imagine the magnitude of grief and suffering among these people. Thank God that He knows each person specifically and thankfully He hears their cries of anguish! He can do so much more than we are capable of but thankfully He also uses us as His own, to touch the lives of others and leave His mark permanently…even on our own hearts as we strive to serve Him. I pray blessings to your team as you continue. Thanks for your prayers, Mary. Serving the refugees has been a very meaningful experience and a reminder to us of what makes us the same in a world that accentuates our differences. I cannot even imagine what they must be going through but then I feel blessed to have a church and a missions pastor who offer love and support to them. Thanks for taking us with you through your words in this journey. Will keep you and the team in my prayers. Thanks for following our journey, Kim, and also for praying for us and the folks to whom we are ministering. Praying for these families..and as they have seen the love of Jesus poured out to them through you and your team, may their hearts hunger for a personal relationship with the Lord and respond to the message of eternal life. Praying for you all as well, for your safety, and to be unhindered in completing the task He has given you for this trip. And praying for the Christians serving there full time; that they are greatly encouraged because of your presence and help, and they be strengthened to fight the good fight of faith in a very difficult place. Thank you, Pam. These are exactly the prayer concerns for this initiative. Thanks for praying. We are having more good visits today. Currently en route to see yet another refugee family living in East Amman. Gotta love the technology that keeps us all connected even when half a world away. Thank you, Pam, for praying with us and for following our journey. Omar, my heart bleeds and I weep along beside you. Dear Lord, what can I do to help You help Your people? Phil 4:13 … I pronounce and demand this truth for Omar and his team in Syria and Jordon, and every soul they touch while there. Dear Lord, keep them safe. Thank you, Jackie. Knowing so many are praying strengthens and comforts us. Thanks for faithfully following our journey. I’m trying to imagine what it would be like if all of us in Katy, Texas were torn from our homes and had to flee to a strange land. It’s UNTHINKABLE!! My heart cries for these refugees and their suffering. Thank you for giving them comfort and prayers. We are praying, too. It would indeed be tough if that happened to us. Thanks for your comment, Frances, and also for your prayers. I find myself thinking, “Wow, Omar is such a great servant of God”, a second small voice says, “You could never do that”. I think both voices are not of God, they are just in my mind and maybe the same voices in the minds of many readers. I know Jesus would just say, “Yes you can, just go love them” and Omar would say, “Go Beyond”. Yes we can. Great job Omar, you’re an inspiration of what is possible when we go with love! Let’s go! Thanks for your kind words, Steve. I am grateful for our friendship and all that you do for the kingdom. Look forward to seeing you again soon in Cambodia. Hey Brother, been pretty busy, haven’t read Ur blog for awhile. This One caught my eye tho. I’ve wept so much in the past year, I’ve wept my weight in tears! Weeping is good for the soul..Why..”He washed my eyes that I may see! That’s why. God takes our tears & puts them in His bottle, doesn’t He? (II Chron15:7) If I weep for the body for which the Soul has departed, shall I not weep for the Soul, that God has departed! Great to hear from you, Gene. Love your tender heart that is always inclined toward God. Thanks for your comment and the Scripture passage.